Looking at Australia’s big four banks (CBA, WBC, ANZ, NAB) we see a condition where the evolution of the global context is under-appreciated, particularly with regards to shifts in the Chinese situation. First, we look at the valuation picture of Australia’s big four banks. Then we consider the bank’s Achilles-heel of reliance on international wholesale funding (where we assess the conditions of such funding markets). Before trying to gauge where we are at regarding Chinese capital flows that have been playing an important role in Australia’s property markets. Such would suggest that the 2015 peak valuations in the Australian banking sector could indeed have marked the top of a multi-decade cycle for Australian banks. The latent risks confronting Australia’s banks appear significant, suggesting a high likelihood that in the years to come lower prices (and lower dividends) are probably in store for CBA, WBC, NAB and ANZ. The first chart shows that the big four banks are priced richly relative to the incomes of the very customers it depends upon for its livelihood. When we seek to symptomatically gauge the conditions of the rather opaque global wholesale funding markets, we find a picture that suggests conditions are tight – presenting latent. Much of Australia’s domestic housing market (of which the banks are heavily exposed to) has been driven by increasing credit lending quantities and also demand from foreign capital inflows into Australia. The following chart shows loosely the relationship between %YOY mortgage lending, Foreign Capital Inflows (through an inverted Current Account Balance) and %YOY Australian housing prices. Despite a falling Australian Dollar, foreigners (particularly the Chinese) have been somewhat willing to finance our current account deficit, while Australian’s have been more than happy to live beyond their means seeking ultimately to overconsume via increased debt loads. Yet in a world where it appears is growing more competitive & protectionist in nature, and with the Chinese authorities increasingly having to tighten down on their capital account, trying to moderate the present capital exodus from their country – we wonder whether foreigners will continue to tolerate the funding of what appears to be an over-exposed Australian economy, banking sector and property market? The chart below suggests that we may be due for another ‘down draft’ in the willingness or ability of the Chinese to fund Australia’s deficits. 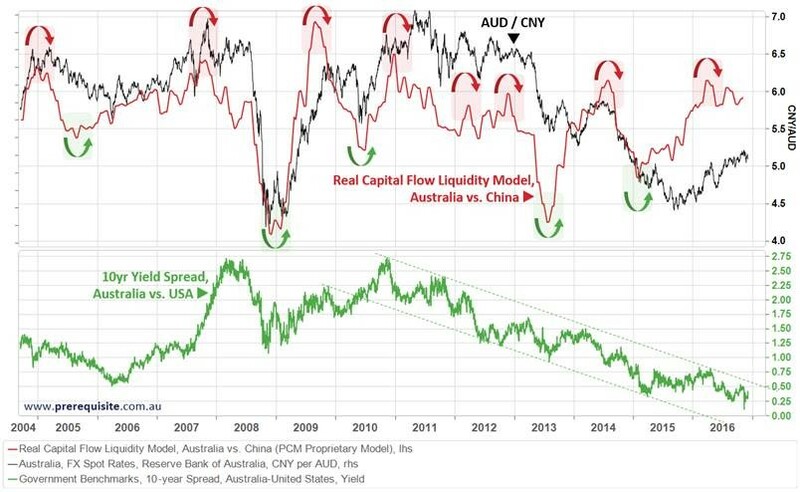 With both the Australian dollar (vs. the Chinese Currency) and capital flow conditions in the world setting up against the continuation of these dynamics. It should be noted that the Australian Dollar vs. the Chinese currency is significantly more volatile than the US Dollar vs. the Chinese Currency, meaning that it is entirely possible for the AUD/CNY to depreciate in line with what the below model is suggesting whilst the USD/CNY is appreciating (i.e. Chinese currency devaluing against the USD). Such would increase the possibilities of a capital exodus out of Australia, and a forced Australian Current Account deficit contraction – a potential that is not supportive of Australian banks or property. 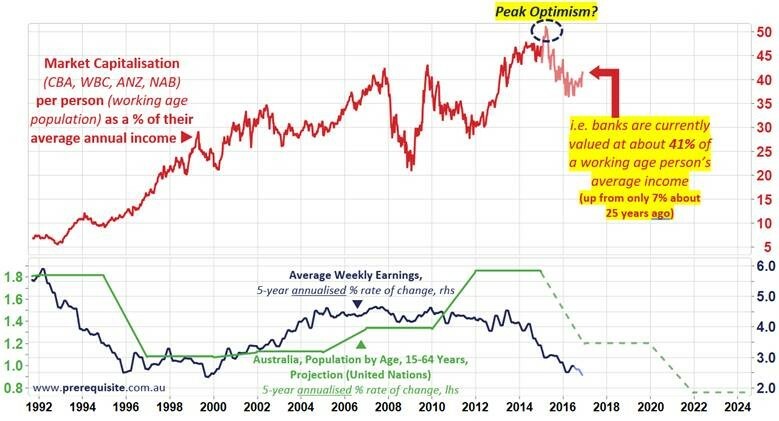 Such would suggest that the 2015 peak valuations in the Australian banking sector could indeed have marked the top of a multi-decade cycle for Australian banks. The latent risks confronting Australia’s banks appear significant, suggesting a high likelihood that in the years to come lower prices (and lower dividends) are probably in store for CBA, WBC, NAB and ANZ.